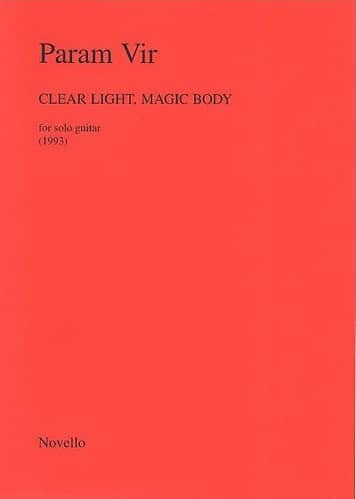 The inspiration for Clear Light, Magic Body came after a visit to an exhibition of Tibetan sacred art at the Royal Academy in London in autumn 1992. The exhibits included several depictions of a tantric icon important to Tibetan Buddhists, known as Paramsukh Chakrasamvar (Supreme Bliss Wheel Integration), a male and female deity in passionate union, symbolising the Buddha as father-mother, or the fusion of wisdom (clear light/female) and compassion (magic body/male). The union is celebrated in the two fast-paced outer movements – Shamvar 1 and Shamvar 2 – which are based strictly on symmetrical scales (modes of limited transposition). Complementary techniques of development and prolongation organise the collage of rhythmic and harmonic characters. Expanding and contracting rhythmic shapes, non-literal palindromes and three-fold rhythmic cadences (this last borrowed from Indian tala structure) support the temporal surface. The second movement, Clear Light, explores the female aspect – wisdom – exclusively. A chorale (once repeated isorhythmically) is interlocked with a freely developing line – reminiscent of an Indian string player’s improvising, especially in relation to the left hand technique. 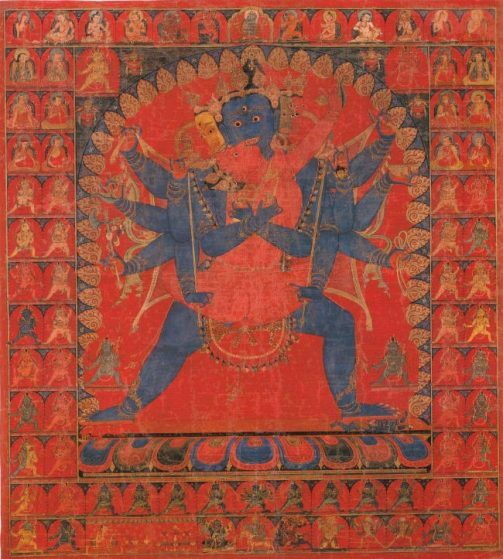 The third movement, Magic Body, is a meditation on the male aspect – compassion. It unfolds two lines of melody that frame a central commentary. This edition marks the long awaited publication of one of the most strikingly original guitar solos of recent years. Not only is this work refreshing in its liberated approach to guitar harmony, texture and sonority, its inspiration in the profound world of Tibetan tantric art supplies a useful and effective ground for the vivid and very challenging musical language employed. 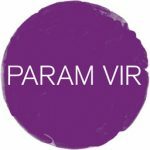 Param Vir is India’s leading composer in the western classical genre, and though some slight reference to Indian music are present, this is predominantly a highly developed product of the world of western contemporary music. The first examination of this score suggests a considerable pre-occupation with extreme mobility, with rapidly fluctuating single and multiple lines ranging over the fingerboard. Experienced closer to tempo these movements resolve into a more measured rhythm of events centred around peaks of expressive intent coinciding with the culmination of the composer’s use of modes of limited transposition (a la Messiaen). Colour in instrumental terms is also very important, and this is largely a very subtle orchestrational affair, with plucked chords, and the particular effects of arpeggiations in various parts of the tessitura. There are also, however, moments of grander gesture in abundance, making the colouristic sphere of the composition appear to work on two levels, the overt and the more covert. The technical requirements of Clear Light, Magic Body are extremely high, though the musical sense required is at least as advanced as the sheer gymnastic facility necessary to bring off the combination of sonority, harmonic sense, development and, beyond all these, a remarkable essence the like of which is rarely found in guitar repertoire. The score is reproduced in the impeccable script of the work’s dedicatee, Jonathan Leathwood. I will refrain from predicting any particular fate for this highly important work; however any recitalist or extremely dedicated post-graduate player will find a wealth of musical invention and value, which justly deserves the greatest success and acceptance in the repertoire.